Lucille’s, a barbecue chain, was one of the original tenants when Victoria Gardens opened in 2004. And it’s still there, while adding a location in Chino Hills. Did you know the Signal Hill-based chain is owned by the same people behind the coffee shop chain Hof’s Hut? The gauzy story on the Lucille’s website about its origins under “Lucille Buchanan” is actually fiction, as the company admits. Ha ha! I don’t feature chains here very often, but when there’s only one or two local locations, I’ll do it. In this case, a group of friends was celebrating a couple of birthdays recently at the VG, so I was there anyway. It was a Saturday night and the place was jammed. 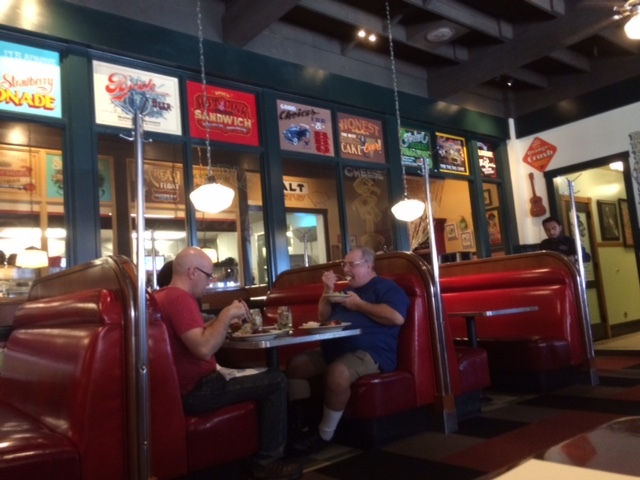 Lucille’s is colorful and corporate-kitschy, with neon signs outside and quaint-looking advertising-type signs inside: “Good choices: FDR & BBQ,” “Was one mint julep the cause of it all?” The booths have coat racks and hanging lamps reminiscent of mid-century diners. But many employees wear earpieces to receive orders from their BBQ Overlords, or maybe Memphis, so it’s not quite cozy. The food’s pretty good, actually. One of my friends swears the jambalaya is the best he’s ever had. My experiences there have been solid. 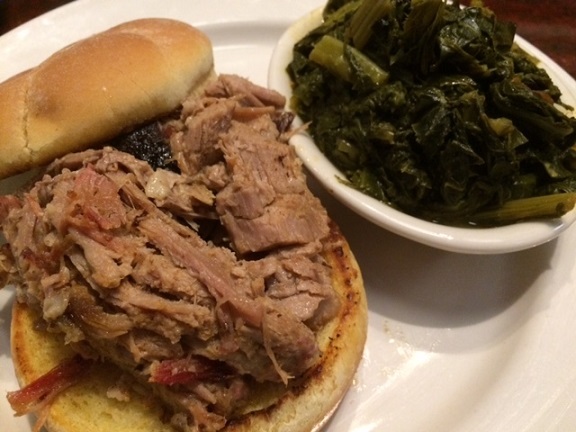 The menu has barbecue, Southern specialties, sandwiches and salads. 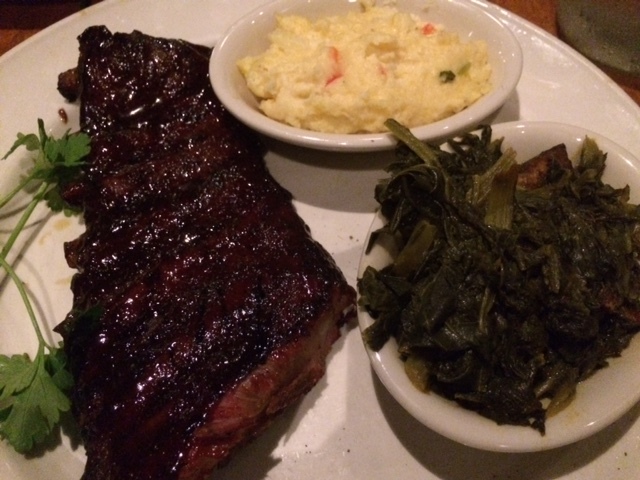 That night I had a decent half-rack of St. Louis ribs ($24, below) and two sides: cheesy grits, boring, and collard greens, surprisingly good. When you’re done, they give you a hot towel, like at a Japanese restaurant, and that’s a nice touch, and better than Wet-Naps, for cleaning sauce off your hands. I went back for lunch a few days later to try something else, getting a pulled pork sandwich ($12, below) with more of those greens. It was a meaty sandwich and I ate some of the pork with a knife and fork. This was a good choice. There’s an adjoining bar, the Flying Pig Lounge, where they have a band every night playing blues. Otherwise, the sound system has blues, of the sleek B.B. King and Eric Clapton variety. They probably don’t know who Peetie Wheatstraw is. We don’t have a lot of true Southern restaurants out here (J&J’s in Pomona is my favorite), making Lucille’s a credible barbecue spot by default. It’s a cartoon version of the South, sure. But so what? Cartoons are entertaining, and as chains go, Lucille’s is benign, and even fun. This entry was posted in Restaurants: Rancho Cucamonga and tagged bbq, Rancho Cucamonga, restaurants, ribs, Victoria Gardens by David Allen. Bookmark the permalink. You have to be ready for lots of noise when you go to Lucille’s, at least at dinner time. I’ve been there for lunch when it wasn’t too bad. I like their food, although in our family there is some discussion as to whether Lucille’s or Famous Dave’s is better for BBQ. Next time, try a side of Lucllle’s mashed sweet potatoes – so delish! I agree, lunchtime is quieter. It was no problem reading by myself at lunch. I prefer Famous Dave’s barbecue but it’s possible Lucille’s is better overall. This is a favorite fun place. We like to choose and share lots of appetizers. Fried pickle we thought a joke but found very good. As you say, it’s corporate kitch, but done with some charm. Staff is also friendly. I was secretly worried someone would criticize me for writing about Lucille’s so having three comments so far, all positive, is nice to see. We enjoy your recommendations. For instance, we tried 7th Heaven in Upland and like it. We might never have noticed it but for your column. Lucille’s is a special place for us. Noisy, but the good music filters through. Staff is great. The only problem I have when going there is trying to choose something to eat. It all looks so good. We usually end us sharing plates. So much fun when someone hauls a large chunk of meat out of the barbeque thingy in front. I’ve made a note of it. Thanks, Steve. I get in ruts like that too–and it really kills me when a restaurant discontinues a favorite meal or side dish. The thought of jambalya is very enticing, but how can I not order tri-tip! 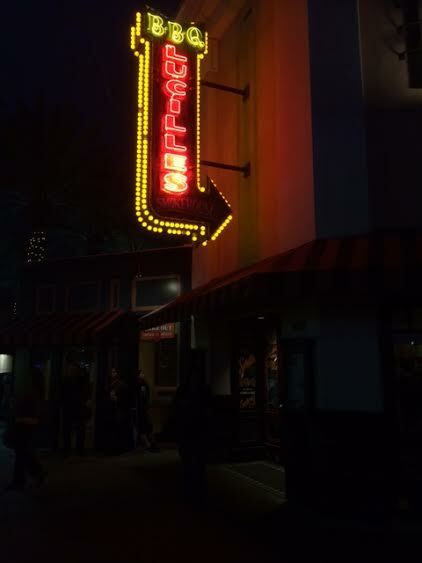 It is a very expensive place–the tri-tip is the best! I am not surprised to learn that Lucille’s belongs to the same company as Hofs Hutt–I had eaten at Hofs Hutt in Belmont Shore–and it was a very popular place there and very good. Love their food! Another great review, David!